BlueRidgeNow.com reports about goods no longer made in USA. Published: Monday, January 12, 2009 at 4:30 a.m.
Perhaps the most important New Year' s resolution American consumers can make beginning today is to buy American. Anyone who has shopped at Wal-Mart in the last few years or other chain stores — Bed, Bath & Beyond, Circuit City, Best Buy, Target, Foot Locker, the list goes on and on — knows that it' s becoming harder and harder to find a “Made in USA” label. This is no accident. For well over a decade, we' ve been told that globalization is a good thing [it is a good thing… for China.]. It will create jobs, strengthen the economy, bolster our image overseas and form good trading relationships with nations around the globe [all those things were true… for China]. While some of that proved to be true, it turned out that far more of the jobs it created were overseas and the economies it strengthened were in other nations. There' s a good reason for that. Nations that produce goods and sell them to their own citizens and the rest of the world create jobs in their own country and strengthen their own economy. First from Mexico, then from Korea, India and China came the unending stream of beautiful goods, cheaper than we could produce them in America. Furniture, clothing, sneakers, house wares, the list of things we could buy from an overseas manufacturer grew almost daily. I have never studied economics. There are only so many courses a person can take in one short lifetime. But it seems painfully obvious that if you export the jobs that are the bread and butter of your labor force, the manufacturing sector will crumble and eventually disappear. Once manufacturing jobs are gone, those whose living depends on those jobs go from paying taxes to drawing unemployment, from eating out once in awhile and taking a vacation now and then to barely scraping by. If they stay unemployed long enough they may well lose their homes. All of the small service businesses in a community suffer when a manufacturing plant closes. Eventually, if nothing else comes along to replace those jobs, whole towns become anemic shadows of the robust centers of activity they once were. Of course, an unemployed worker can always retrain for a new job, maybe something like computers and information technology. But considering how many American companies now outsource computer related jobs, they might have to relocate overseas to get it. Even medical transcriptionists now work out of India instead of your neighboring town. What about building? People always need somewhere to live and someone has to build those places. These days we all know what happened to that theory. The thundering crash of the housing sector was inevitable, not just from shady lending practices, but from the steady exodus of jobs from our country adding up year after year. There is virtually no area of the job market that has not been affected by outsourcing [Incorrect. CEO, CFO, and other upper management positions were completely unaffected by outsourcing. In fact, they were given bonuses and raises for reducing costs by outsourcing other jobs overseas.]. Once we outsourced a main artery of our economy, the manufacturing sector, the corollary jobs that service those blue collar workers began a slow but steady bleed that drained much of the lifeblood out of our economy. And so, as simplistic as it seems, one of the most patriotic acts any of us can do these days is to save up a little longer and ante up a little more for American made products. If enough of us make a commitment to buy American whenever we can, aiming to have at least half of our purchases American made products, we will see a slow, but steady turn around in our job market. There is an old saying: Cheap is dear. We are paying a dear price for the cheap spending spree of the past 15 years. As we look around at the tanking economy, instead of castigating ourselves for allowing America to be sold a “bill of goods,” let us do the most positive thing we can do: Buy American. Sounds like an easy solution right? Simply buy American goods. Unfortunately, The Daily Record reports that consumers are having a difficult time finding products labeled American-made. For Lehman' s housewares product specialist Jean Geiser, focusing on locally made products often means she knows the personal stories behind the creators. Her product representatives keep an eye out for U.S.-made products because they know she' ll ask for them before she' ll ask for imports, and she feels a personal sadness when a manufacturer closes or sends production overseas. WOOSTER -- A dilemma faces shoppers: Buy U.S.-made, or buy imports. Buy quality, or buy cheap. Help the communities in which they live, or help people they may never meet in places they may never visit. Within that question are smaller questions, such as whether a product is entirely made, partly made, or just assembled in the U.S. Many shoppers choose to look at the bottom line -- the price -- thanks to the big-box revolution, which made overseas goods cheaply available. Some, such as Cheryl Fields of Wooster, go out of their way to try to find U.S.-made products, with mixed success. "I feel that it's important. If I'm going to spend my money, I want to make sure it goes back to a person who's living in the United States. They're raising a family too. I want to support my fellow American," Fields said. "Have you ever gone out and tried to look for a toaster made in the U.S.?" Fields said. She remembers the day Levi Strauss & Co. announced it would move production overseas, saying U.S.-made products are more rare than even five years ago. "I think that's one of the reasons our country's in such a fix now. We don't make anything anymore," Fields said. For her, it's not necessarily a matter of buying cheap -- she's found U.S.-made shirts that cost roughly the same as imported shirts [If you can find the US company that manages this unbelievable feat, invest in it. This company will do amazingly well as the dollar crashes], she said. But for retailers such as Sam & Stan's Army-Navy Store and Lehman's, it often does come down to price. Many U.S. products cost more than imported products -- as much as three times more -- because of the benefits structure for U.S. employees [and the overvalued US dollar], said Glenda Lehman Ervin, vice president of marketing for Lehman's. The store places a priority on selling locally made products first, then U.S. second and European products a close third. "We do not replace a U.S.A. vendor with an imported vendor," although sometimes manufacturing is moved overseas without retailers being notified, Ervin said. "If I had access to or could get more American-made items, I would sell them. The catch is, for the type of market we are after, many if not most of our customers want American-made but they want it at the Chinese price, and those don't go together," said Larry Wentz, who owns Sam & Stan's. "... Then mix in the economic conditions, people are only going to be able to spend the money they have [in other words, as long as the US dollar is overvalued, foreign goods will make up a disproportional share of US purchases]." The problem with competing solely on price, Ervin said, is "somebody already won that war." [No they didn' t. Once the dollar crashes, the US will once again be able to compete on price (in fact, they will probably outcompete anyone on price)] Comparing a mass-produced, imported product to handcrafted goods is like comparing a fast-food hamburger to a meal at The Olde Jaol; price isn't the only difference, she said. Big-box stores changed the way people shop and are one piece of a bigger puzzle of shopping trends, Ervin said. Suddenly, shoppers were looking for family-oriented products and products that were made within their own country. Recent safety fears, such as those surrounding the lead scare and food safety scares, increased that emphasis on comparatively dependable U.S. products, she said. The trend also seems to be related to increased interest in "green" or "eco-friendly," people-powered, organic, locally made or locally grown, "authentic" and durable practical items, Ervin said, suggesting a variety of trends are converging into a greater interest in one's own community. She's capitalizing on that trend by flagging U.S. products in the catalogues and in the store because customers often ask about a product's country of origin. 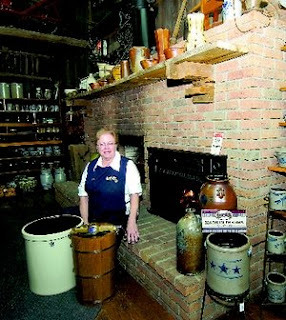 There are some products that are just plain impossible to find, she noted; for example, the hurricane lamp is one of Lehman's staple products, but one component of the lamp is only available overseas. Manufacturers such as Wooster Brush Co. know how convoluted the process is. Laws regarding "country of origin" labels are very specific and state all or substantially all of the product must be made in this country before it can bear the "made in U.S.A." label; sometimes, labels state a product was assembled, not manufactured, in the U.S.
"It doesn't give the Wooster Brush Co. credit for having a number of good engineers," President Al Rodd said. The company handles product development and creation in house to the greatest extent possible, although raw materials are in short supply, said Scott Rutledge, vice president of sales and marketing. Wooster Brush customers prefer U.S.-made products, Rodd said. "We are getting more and more (requests) from our customers ... it's a direct reflection on the economy. They want to support any American-based company they can," Rutledge said. 1) Globalization destroyed America by outsourcing its manufacturing sector. The economies globalization strengthened were in other nations. 2) Despite rising trade in services, most world trade is still in manufactured goods, which means that manufacturing is still the foundation of a healthy economy. 3) The only jobs completely unaffected by outsourcing were those of CEO, CFO, and other upper management positions, which profited from outsourcing other jobs. 4) It's getting difficult to find a "Made in USA" label here in America. 5) American manufacturing sectors has been reduced to making “cutesy craft stuff”. Pitiful. 6) As long as the US dollar is overvalued, foreign goods will make up a disproportional share of US purchases. Only after the dollar crashes will the US be able to compete on price once again. 7) The degree of weakness in America' s manufacturing sectors can be seen by the offshoring of its raw materials providers. Conclusion: America's manufacturing (what is left of it) is in a sad shape. This entry was posted in News_Developments, Trade_Deficit. Bookmark the permalink. Maybe Geithner's anti manipulation talks will eventually turn into deeds, and the Yuan will rise to a more normal value - making cheap Chinese imports not so cheap, and returning America to manufacturing. The stuff Geithner said confused me. Was that reverse psychology? In order for the Yuan to strengthen while China boosts domestic consumption, China would have to depeg from the US dollar. And how can you call for a strengthening of the Yuan while at the same time expect to sell trillions more US Treasuries? Who does Geithner expect/want to buy the US Treasuries? I think it's reverse psychology. And it will fail as Geithner gets his wish and China depegs from the US dollar to stop the Yuan from depreciating while stimulating domestic consumption. Here's a telling anecdote. Yesterday I felt like making some cookies. I haven't made them in a long time and it was so cold that I wanted to use the oven to help warm the house - but I digress. When I took my heavy aluminum baking sheets out and chanced to look at the underside, I was surprised to see the words "Made in USA." Of course, I bought them about 15 years ago. Today such things are probably made in China. Anyway, what's noteworthy about my little anecdote is that I was surprised to find something that was actually made here. should I spend 25,000 for a 2009 Chevy Malibu that gets 33 mpg on the highway, or spend 25,000 for a 2009 Toyota Prius that gets 47 mpg on the highway and 48 in town? I would love to buy American if we made world class products. It's true, it is difficult to find the Made in USA label. It's a shame because the US still makes a lot of consumer products. As noted, the consumer can't find the domestic product at the big box stores.